A software product could be tested in multiple ways which may involve execution of software application code or just testing system externally with the evaluation of system's functionalities and attributes. In this article, we are going to spot the exact differences between above stated two different ways of testing i.e. 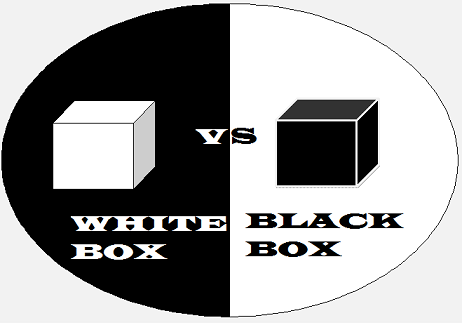 white box testing and black box testing. It is the technique to test the internal structure code of a software product with the help of logic derived from the test data. This is the form of software testing which is performed by a tester without any knowledge of the source code of the software. 1. In white box approach, a tester needs to have prior knowledge of the internal structure of the code embedded in the software product. 1. Tester has no knowledge of the internal code structure of the software product. 2. Test cases require a detailed overview of the product design. 2. Only the requirement specifications of the product form the basis for test cases. 3. The requirement for detailed knowledge of the software, white box testing requires the services of a tester with excellent programming skills. 3. The tester may not be required to have proficiency in programming skills. 4. White box testing is generally more suitable for lower testing forms such as unit or integration testing. 4. Black box testing has been found to be more suitable for carrying out slightly higher levels of testing for instance, user acceptability tests. 5. The sample space for test inputs is comparatively small. 5. Requires a very large sample space for test inputs. 6. Designing of test cases takes a long time. 6. Designing of test cases takes lesser time when compared with white box testing. 7. White Box testing doesn't fit in well with functional testing. 7. Whereas Black box testing works very well for the execution of functional testing. 8. White box testing is generally performed by developers. 8. Black box testing is generally performed with the aid of professional testers. 9. White box testing enables easy automation of test cases. 9. It is not easy to take the support of automation in test cases. 10. Revelation of hidden errors in code is easy. 10. Difficult to find out hidden errors. 11. White box testing is not suitable for testing resilience of applications against the threat of malicious code attacks. 11. For checking the functioning of security applications for IT products Black box testing has an edge. 12. It is not so time consuming when compared with Black box testing. 12. This form of testing puts a drain on time. You may also like to read our next related article: White Box Testing Vs Black Box Testing Vs Gray Box Testing .